Spring in Boulder can bring warm and pleasant days, or heavy wet snows to the area. The Seesaw Spring weather we expierence on the Front Range of Colorado can open the door to tremendous conditions conducive to dramactic imagery. This view of the Flatirons from Boulder Open Space and Mountain Park's property south of Boulder reveals those epic conditions. The previous nights Spring storm is moving out after coating Boulder with fresh snow. 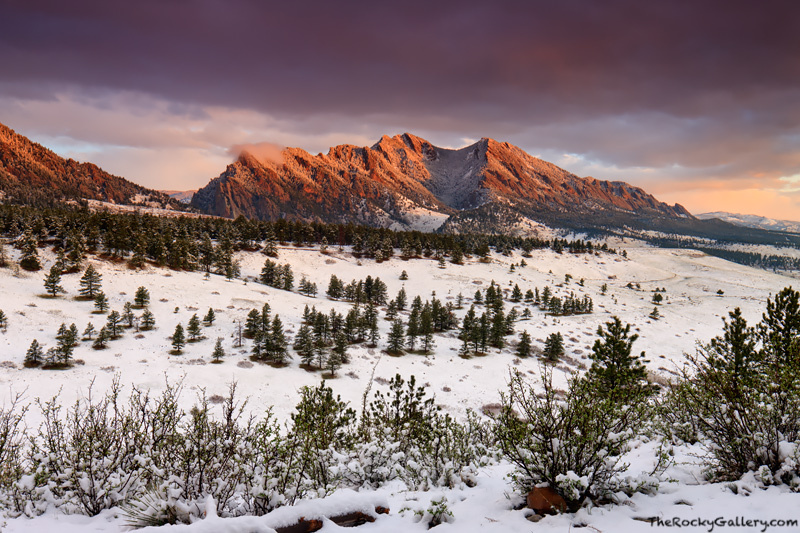 Just enough of a break in the clouds on the horizon allowed the Flatirons to glow oranage and red, creating dramatic lighting on the Flatirons and fresh snow. Photo © copyright by Thomas Mangan.